Well maintained parking garages present a positive image for their owner and operator, surrounding businesses and the city as a whole. Customers notice when your parking structure isn’t clean and well-maintained and will take their business elsewhere. Parking garage cleaning should be part of the comprehensive maintenance program for your business or facilities that you manage. A clean parking area promotes repeat business and discourages littering and loitering. Regular parking garage pressure washing also extends the life of the structure as the buildup of snow, deicing salts, and road grime damages concrete over time. Being in Chicago, the regular removal of deicing salts is especially important. 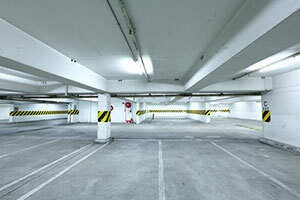 At Northern Power Washing, we have the expertise and specialized equipment to clean even the dirtiest parking garages. Our high-flow, hot water pressure washers take care of everything from simple wash downs to deep cleaning, from salt and dirt to oil stains and tire marks. We work around your schedule offering nightly, weekly, monthly, biannual and annual cleaning services. Our crews operate 24 hours a day and 7 days a week making it easy to accommodate any parking schedule. We are also able to accommodate structures and areas without easy access to a water supply. Our crews are able to bring in their own water and perform wastewater recovery and filtration to meet the Illinois EPA standards and the guidelines of the metropolitan water reclamation district of Chicago. If you’re unsure of the exact needs of your facility, we can assist in creating a cleaning program that will keep your garage clean and appealing to customers. From nightly trash pickup and sweeping to annual deep cleanings we can help make a program that makes sense for not only the traffic your garage sees but also your budget. With Northern Power Washing on your team, you can rest assured that your project will be completed on time and within budget. Contact Us today for your free no pressure quote.